This base is made from a Lollipop stick 4” long. I get them from Hobbycraft, £1.99 for 50, The first thing I do is chamfer the edges. Then I glue on a length cut from a wooden barbecue skewer to start forming the earthen .. I cut a bit off the top of the skewer and taper the ends. Use filler to build up the sides of the bank. I use B&Q All purpose powder filler. Paint the thing brown, I use emulsion paint from Dulux. Just over £2 for a 250ml sample pot and they can do you just about any colour you want. Textured with Budgie grit stuck on with PVA glue. Sand would work just as well. Then I seal it all up with a 1:1:1 mixture of emulsion paint, PVA glue and water. And leave overnight to dry. Drybrush to bring up the texture. A tree is glued into the hole. You can buy trees like this on Ebay. They come from China and you can get 150 of the things for about £15. If you don’t want to wait a couple of weeks or are reluctant to take your chances with a Chinese Ebayer called WeHonest (99.9% positive feedback on 38,000 sales) , then you can get what look to be the same trees from Minibits in the UK. Some of the trees come in a rather luminous shade of green, I tone then down by dipping them in a mixture of Acrylic paint, PVA glue and water. This gives them a better colour and the glue holds all the flock together and stops bits of it falling off the armature. The hedges are made from small pieces of Woodland Scenics Clump-Foliage, I glue them on to the base using a hot glue gun. You can get Woodland Scenics products from model railway shops and it’s also available in larger branches of Hobbycraft. I use mostly Medium Green and Light Green. The vegetation on the side of the banks is Golden Straw Fine Ground Cover Turfs from Hornby’s Skale Scenics Range. You’ll get this stuff in the same places as you’ll find the Clump-Foliage. That’s the bocage hedge finished, though I always slather on copious amounts of diluted PVA glue to bind it all together. If you don’t do this then bits of the Clump-Foliage will fall off over time. 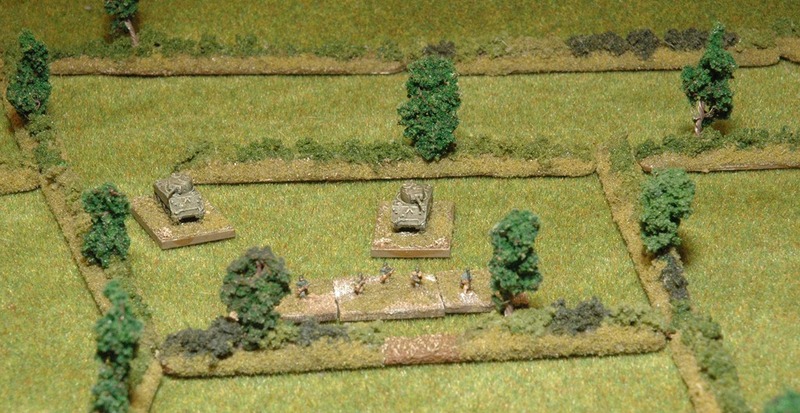 I am just taking a break from my 6mm Napoleonics to do some ww2 using IABSM in 6mm. Nobody makes a convincing 6mm bocage hedge so I have borrowed your technique. Excellent. Glad you found my post useful. Thanks for the nice tutorial. I plan on scaling this up to 20mm using half-round, pine molding for the base material.